Florence made landfall this morning (Sept 14) along the South Carolina-North Carolina border. A tremendous amount of rain has already fallen on the Carolinas Friday morning (Sept. 14) in the hours after the Hurricane Florence made landfall along the border. People in the storm's path shared video on social media of the now-Category 1 hurricane's still-intense 90 mph (150 km/h) winds as the eyewall moved through Wilmington, North Carolina. But the real story of the storm is the deluge its already created, and will continue to add to in the coming days. Florence has already dropped more than 30 inches of rain in some areas of the Carolina border. Those numbers will only rise as the slow-moving storm hovers over the region through at least Saturday (Sept. 15), according to the National Hurricane Center (NHC). In its latest update, the NHC predicted 20 to 25 inches of rain across much of the impacted region, with localized totals exceeding 30 or 40 inches. That deluge will lead to "catastrophic flash flooding and prolonged, significant river flooding," according to the NHC. The hurricane's storm surge is already visibly dramatic and represents an ongoing danger as the tides come in and the storm's winds continue to push more water over land. 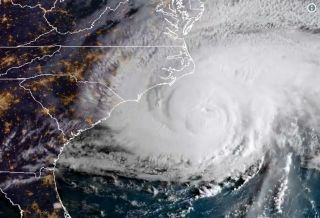 At the highest point, between Cape Fear and Cape Lookout along the Carolina coast, surge totals of 7 to 11 feet (2 to more than 3 meters) are expected, according to the NHC. But, as The Weather Channel demonstrated yesterday (Sept 13), a surge of even a few feet can be life-threatening. And the NHC expects at least 4 feet of surge (with a maximum of 9 feet in some areas) across a region extending across much of the North Carolina coast. Expect more updates on the rainfall, surge, and winds in the coming days.